As a part of Walker’s continual pursuit of growth, faculty members have been looking at how to better develop critical thinking skills in our students. The entire school met for a talk about critical thinking skills, addressing questions like what is critical thinking, what makes a critical thinker, and how do we as teachers encourage critical thinking. I loved this list because I see these skills being accessed and developed every day in the Preschool. Yes – our young students use critical thinking skills too; I would venture to say they are even better at it than we are as adults. Preschoolers have not developed a fear of failure yet and are willing to explore their world in a way that allows them to learn and grow. And there you have it – Preschoolers at work using collaborative critical thinking skills and effective communication to draw conclusions about the world. I love eating lunch with my students! As a parent, how can you encourage this kind of interest in problem solving using critical thinking skills? First, stop answering all your child’s questions before giving them time to think through a solution independently. This is most easily accomplished by restating the question as an observation. I like to use the go to phrase “You are wondering about…”. Then, follow this up with questions like why do you think that? How do you know that? Can you tell me more? These students I wrote about today are three and four years old. If they can engage in a critical thinking conversations then anyone can! When we encourage our children to use Dr. Wagner’s Seven Survival Skills to search for the answers to their questions, we are sending the message that we believe they are skilled and capable learners. We are modeling the value in accessing prior knowledge, gathering information, problem solving, and using persistence to reach our goals. Slow down. Give your children time to think. You will be amazed at the knowledge they give back to you. Last week with the approach of Rosh Hashanah, I was excited by the idea of a day off. I peppered my kids with questions as we pulled out of the parking lot on Wednesday afternoon. “How ’bout the fair? What about a hike? Is it too early to get our pumpkin?” Even before they said a word, their blank expressions in the rear view mirror gave me my answer. Mom, we are tired. Let’s do nothing. We just want to hang out at home and just…hang. We did just that – with the exception of a trip to the grocery store. And thanks to the lessons that I have learned in my time as Interim Preschool Director, I slowed down to enjoy my own children. One (of the many) things that I am re-learning about Preschool age kids is that most do not hurry very well. Whether they are picking out a book, walking to lunch, or getting in or out of the car- they just don’t like to be rushed. On Wednesday, Mrs. Maclean and I walked a handful of students to the Lower School for their picture re-takes. I normally make the trip between buildings in about four minutes. This journey took a bit longer but it was so much more fun. On the way, we were reminded as to why our young ones aren’t interested in picking up the pace. You see, it is impossible to hurry when you are so busy noticing everything. In a world where so many are obsessed with taking selfies, being famous for something, or staring at some sort of screen, children are looking out, up, and around; they are taking in everything around them. 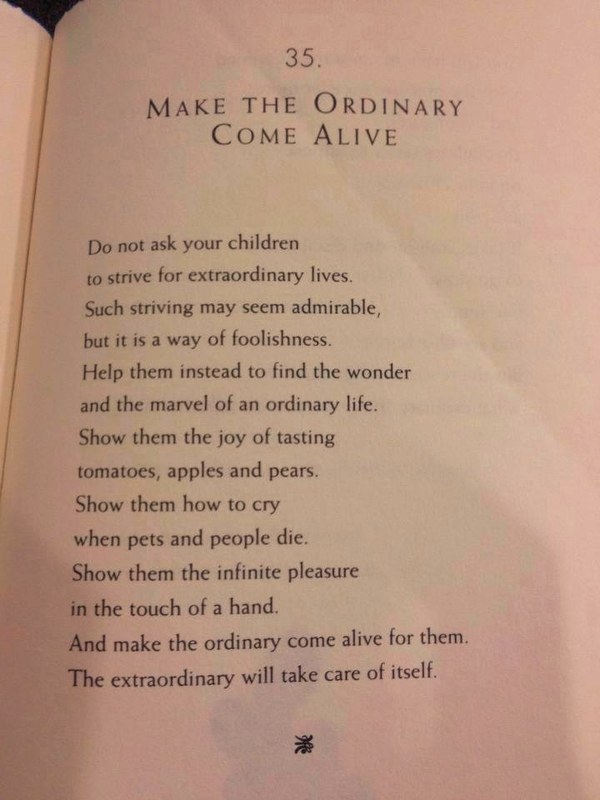 I was reminded of these words from William Martin. However you spent your day off, I hope that you enjoyed some extraordinary ordinary moments – and L’Shana Tova to our Jewish families! 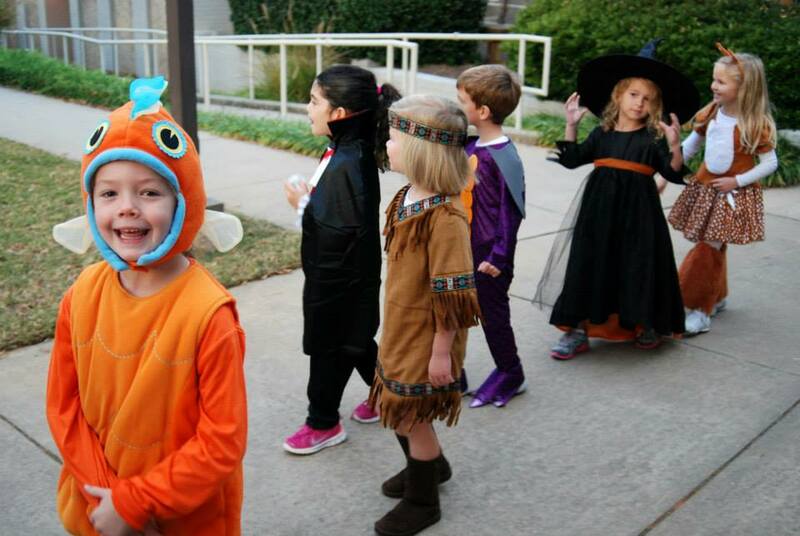 Last fall the Preschool held its annual Halloween Parade where students and teachers dressed in their favorite costumes and walked around campus. You could hear remarks like, “oh how cute,” coming from students and teachers as they saw super heroes, princesses, and even Elvis stroll by them. There is no doubt, these preschool children were adorable! However, I could not help but wonder if our admirers realized these children were far more than just cute kids in costumes. They are amazing learners, thinkers, explorers, investigators. Do they realize how critical these early years are in a child’s development? These children are young and have lots to learn. Parents might ask if it really is necessary to start Walker in Preschool. Research says a definite YES (Estes, 2004)! According to Ms. Estes and many other researchers, the first 5 years are paramount in setting a foundation for the future. Children are born with a vast number of dendrites in their brains that are just waiting to make connections and expand. If those connections are not made early, they will eventually prune themselves to make the brain more efficient. Recently Dr. JoAnn Deak, researcher and brain expert, visited Walker. She stressed the importance of taking advantage of windows of opportunity for learning that appear in the brain during the first few years of a child’s life. These “windows” represent the prime time the brain is ready to learn. When missing this optimal time, learning is more difficult. As educators, we need to help our students make many, many connections to create a strong foundation on which children will build future learning… connecting both hemispheres of the brain to enable them to work together. But the children just play, many might say. 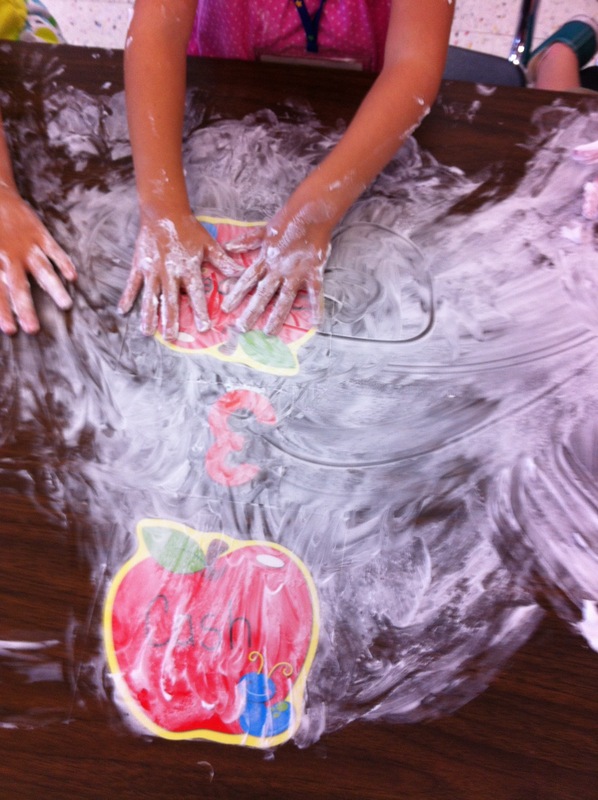 With young learners play is their work. They use manipulatives, props, materials for trial and error to discover and investigate possibilities…to problem-solve and cultivate a spirit of wanting to know. They answer open-ended questions and think for themselves to envision options and possibilities. This empowers children with self-confidence and a willingness to take risks. The brain loves it when we make mistakes so that it can carve new routes for neurons. This allows the brain to grow and create more connections and strengthen those already established. Walker’s Preschool has many resources that make it the right choice for a young child and his/her growing brain. Students experience co-curricular areas of art, computer, library, music, physical education, science and Spanish multiple times each week. The early years are prime for learning a foreign language per Dr. Deak, so students go to Spanish class 3 times each week. These co-curricular teachers are trained in their specific subject areas, trained to teach young children, and experienced as facilitators to encourage critical thinking in our youngest learners. For example, one library class read the book, It’s Not A Box, and discussed how a box may not be a box, but a canoe, a guard house or a sled, if we use our imaginations to examine it in different configurations. We also have a learning specialist who is trained to spot a bump in the learning journey that may be addressed early before it becomes a stumbling block later. We have a licensed counselor and registered play therapist who, again, is trained specifically for young children and their needs. She visits each classroom for monthly guidance lessons about topics such as being a good friend or bullying prevention. Young learners are amazing…when exposed to developmentally appropriate activities, they blossom and grow, all the while establishing strong foundations on which to build as they progress with their education. Some of these activities include place value and patterning that prepares students for higher-level concepts in algebra; and decoding, and critical thinking that improve fluency and comprehension in literacy. I am passionate about preparing our youngest students to be ready for what lies ahead of them. We align curriculum so that Preschool students are well prepared for what is required of them in Lower School. This allows learning to be fun and children to be successful rather than struggling to catch up and learn background information before being able to move forward with the curriculum in their grade level. It simply isn’t fair to ask our children to address concepts that have not been introduced and ask them to make academic connections that were not established as background knowledge earlier. I love my job! Who wouldn’t enjoy working with bright, energetic young children and dynamic, enthusiastic teachers every day? This energy and excitement is contagious. We get excited together as we discover how magnets jump in our hands or discover how to program a Beebot robot to travel on the path we have designed. These students are certainly adorable children who were cute when they dressed in their favorite costumes at Halloween. They were cute when they toured parents around the Preschool Art Show and explained their artistic creations. They were cute when they dressed for the tea party or the homecoming pep rally in their Walker wear. But they are so much more! They are serious learners who are embarking on an important educational journey that is crucial for reaching their potential. Over the past several weeks, Lower School and Preschool teachers have “walked as a child” from morning carpool until afternoon pick-up. Last Friday, Mrs. Sue Rittenberg, Preschool and Lower School Learning Specialist, spent the day as a fourth grader. And if she were to let us peek into her journal or diary, fourth-grader-Sue describes her day from the point-of-view of a Walker student. After socializing at my table in Gatti Hall, everyone lines up, quickly, to get upstairs. The day starts fast, and the pace is set. There’s an easy flow to that first organizational piece of dropping off homework and writing down assignments. Teachers have us programmed well to get assignments from the white board — some sit at a desk, but others sit on the floor right in front of the white board. (Probably would have been me in fourth grade!) There’s a quiet hum as students hold up their hands to have assignments signed off by Mrs. Mulroy. At precisely 7:55 a.m., we are hearing the next chapter read out loud from a great novel she’s reading to the class. Must be great to have your own “book on tape” installment every morning. First class is a social studies test. Wow, Mrs. Jackson has quiet music playing when we walk into the room. (My brain sure feels calmer just having that music in the background.) And I can’t believe how helpful she is when she hands out the test. She actually tells us which key words to highlight for the first four questions. Even better, on the second page, she draws the picture we went over in class to remind us of the details for that Mayflower Compact question. And she tells us to come up to her desk and say, “I have a question about this question.” Some kids go ask questions…it’s no big deal, and makes a big difference if I don’t understand how the question is worded. Now we move to math class. I’d probably feel a lot differently about math if I had Ms. Ahmed as a teacher in fourth grade. She’s always saying things like, “I’m not that fast with my multiplication facts…can someone tell me how they would get that answer?” or “Numbers are easy, it’s the words that get in the way — let’s walk slowly through the words.” A classmate said that she didn’t understand the reason zero wasn’t a prime number and, get this, Ms. Ahmed said, “I don’t like that reason either, and I’m going to come back with a better reason on Monday and share it with you guys.” It’s super safe to raise your hand in here, and you don’t have to be certain you have the exact right answer! Finally, it’s recess and then lunch — then PE. No one complains about running 4 laps right after lunch, probably because Coach Brady just makes everything FUN, even all the conditioning drills! (Those fourth grade arms were much stronger than mine doing the 5 pull ups following a full minute of sit-ups). What better way to end the day than to have Science with Mrs. Waddington and Mrs. Mullins? When Mrs. Waddington said we were having a quiz, I thought “Oh, great.” But guess what? She had us work with a partner and make up our own quiz! That’s more fun, but actually not that easy. We had to make up easy, medium and hard questions — plus a bonus question. And we had to figure out the answers for every question. Science goes by way too fast—all the kids say that! Now, quickly check the books we need for homework, listen for our carpool number, and down the steps to carpool circle!!! What did I learn about Walker from this experience walking as a child? Students feel so respected and are constantly encouraged to ask questions or make comments on other’s answers by agreeing or disagreeing. Learning strategies are being taught in so many ways and naturally incorporated into how students ask for help, how to use resources, and how to walk through a test. Being in the classroom, it’s easy to feel how much these teachers care about each student — encouraging someone to ask a question that they haven’t heard from yet or authentically commenting on what a great connection was just made. These kids should be TIRED when they get home — they are going nonstop, and it moves fast!!! About the Author: Mrs. Sue Rittenberg, M.A., is the Preschool and Lower School Learning Specialist. She is in her seventh year at The Walker School and is a certified Speech-Language Pathologist. Over the holidays, I was getting in some last-minute shopping when I heard someone call my name. I turned to see two Walker Upper School students whom I taught when they were five years old. Although I see them at school occasionally in passing, they stopped their busy holiday schedules to call me over. What a treat to stop and chat with these young men for a quite some time. I was impressed by their genuine interest in me and my holiday plans. After catching up a little, we retold some of our favorite stories from kindergarten. While walking away, I thought how proud I am of our continued relationship over the years. They will always be partly “mine” because I am so invested in their lives….and maybe surprisingly, they are somewhat invested in mine. The visits with these young men brought my thoughts back to the days when I was privileged to have those students as curious five-year-olds…when the parents and I worked together to nurture them academically, socially, and emotionally. I thought about the relationships that began 12 to 14 years ago….meaningful relationships that were established with young children that have remained over these many years. What a joy to watch these boys transition into mature, responsible young adults…young adults that are critical thinkers with theories of their own they can defend…young adults who are caring and find time to have conversations with adults who have been involved in their lives. I will be one elated educator as I, with their parents, watch these young men walk across the graduation stage and begin their next journey well prepared and supported. Recently, an independent firm conducted a survey of our school to help us with our five-year strategic planning. Many parents, students, and faculty participated and results found that one of Walker’s greatest assets is its teachers. Students felt that teachers were willing to stay after school to help them with their academics and genuinely cared about them and their success. Most of us can look back on teachers who have taught us and pull out one or two whom we felt truly cared about us. For me, one was Ms. Shepherd, my senior English teacher and annual staff sponsor, who treated us as individuals with different talents…convincing me that I could be editor of our annual that year…an experience that I still treasure. In his book, Good to Great, Jim Collins discusses the importance of getting the right people on the bus…the need to find the right folks for the right job. Getting the right people on the bus can be a challenging process for schools. It involves finding excellent teachers who are committed to students and to a school’s vision and mission. It is finding the Ms. Shepherd’s of this world who built on her students’ interests and allowed them to shine. Walker recruits and strives to retain the best, most-talented, committed teachers who are dedicated to giving their students a caring, engaging educational experience. A few weeks ago I visited Mrs. Katherine Harrison’s Fifth Grade Spanish class. I was amazed at how well the children responded as she conducted the entire class in Spanish! She created groups and assigned projects according to students’ interests. They were excited to be there, and I left wishing my French classes had been as well taught when I was in high school! So how important are teachers really? Research indicates that teachers are key to student learning (Inlay, 2003). U.S. Secretary of Education, Arne Duncan, believes that the best thing you can do for children is to get them in front of an extraordinary teacher (Net Assets, 2012). Teachers set the climate for the classroom and provide role models for their students (Bond, 2010). They create a class culture where children feel a sense of belonging and feel free to take risks, to make mistakes. This culture provides an atmosphere of collaboration that is less conducive to bullying, teasing, and exclusion. At Walker, teachers of each division are passionate about their students…“called,” if you will, and specifically trained to teach the particular age with which they interact daily. They know their students; they know when they are having a bad day or when they are celebrating a personal win. They are happy with them and sad with them. They cheer for them at plays, games, and assemblies. This connection is one reason Walker teachers love to teach and one way they demonstrate their authentic interest in their students beyond the classroom, creating meaningful relationships that will remain in one’s memory for a lifetime.